All the books listed below are should be FREE. Please verify prices before you buy as they can change without notice! The following covers are links to Amazon, but many of these titles are also available on other retailers! Beneath the Broken Moon: Part One - Release Day! Hey everyone! I'm so excited that it's release day for Beneath the Broken Moon: Part One! In addition to this new book coming out, I'm celebrating the release with a few fellow author friends at Facebook TONIGHT from 5:00PM to 9:00PM (Eastern Time). Beneath the Broken Moon - Release Party! We have plenty of great prizes (including Amazon GCs and ebooks), and it's going to be a lot of fun. I hope to see you guys there! Werewolf relationships are all about influence and offspring, especially as they are becoming extinct. But Carmela Santiago resents that type of life. She dreams of falling in love, not following the example her parents have set. One of the men had greying hair and a rounded belly, which explained the slower, heavier footfalls, while the other guy appeared younger and super-athletic. No wonder I was having trouble getting away. If he hadn’t been so scary, he might’ve been attractive. Pure masculine aggression raged through him, tensing his shoulders as his gaze focused solely on me, his prize. Each man carried a large-caliber handgun. I was just glad they were too busy running to try to shoot me...for now, at least. Alpha shifters are on the prowl, and they're used to getting what they want. But there's more to claiming a destined mate than raw power, and they'll have to prove themselves worthy – in more ways than one. 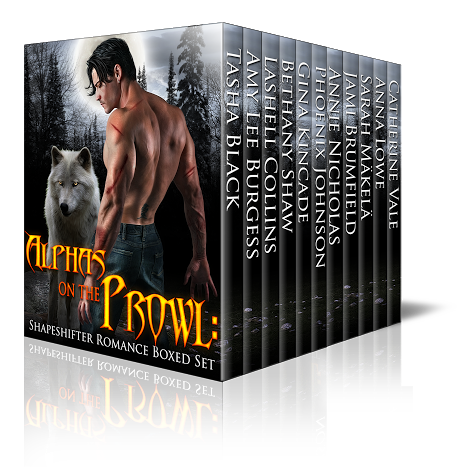 Alphas on the Prowl is page after page of passion and pleasure in this box set featuring eleven tantalizing shapeshifter tales from NY Times and USA Today bestselling authors! I'm excited to be sharing the cover for Alphas on the Prowl. It's part of a joint effort that authors of The Wolf Pack are doing. The first one, Alphas Gone Wild, is already out if you haven't checked it out yet. Tasha Black, Amy Lee Burgess, Lashell Collins, Bethany Shaw, Gina Kincade, Phoenix Johnson, Annie Nicholas, Jami Brumfield, Sarah Makela, Anna Lowe, and Catherine Vale are in this boxed set. It'll feature new shifter romances! My story, Captive Moonlight, is going to be in this. There's a short excerpt below. Click the author names above to visit the other authors participating in this set! Joe frowned at the sudden change of expression on Charlotte’s beautiful face. What had caused… The rapid sound of boots hitting dirt next to him penetrated his thoughts. He’d been so focused on his lover. Damn it. Twisting around, he faced the men, wondering what they wanted. More importantly, he wished he knew if they’d seen him come from Charlotte’s window. He didn’t want her to be looked down upon by anyone because of what they’d shared that night. Her father would never let Joe near his daughter again if he knew. The men closed in on him, standing much closer than Joe felt comfortable with. He watched them in turn, keeping an eye on each of them. His wolf instincts were going out of control. “I’m sorry, sir, but I already have work. Thanks for the offer.” Joe stepped aside to move around them, but the whistling of metal sounded near his head. He turned and grabbed the barrel of the pistol. The thin man whose gun he had grabbed had wide, surprised blue eyes. Pain filled Joe’s head, and his legs went out from under him. He cursed himself for getting distracted.